Daniel Davis, Kate Jennings Grant, Andrea Martin, Campbell Scott and Megan Hilty in "Noises Off." Talk about a test of thespian mettle. 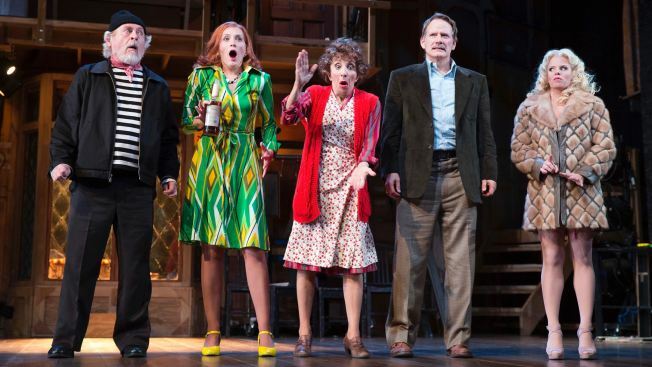 “Noises Off” requires its cast to do pratfalls, slide around on sardines and -- in a new revival from Roundabout, now open at the American Airlines Theatre -- slam eight doors on a two-story set some 100 times. An A-list ensemble, led by beloved comedienne Andrea Martin, takes classic scenes and amps them up. So here, an actor doesn’t just fall down a flight of steps -- he flips over a banister with an acrobatic flourish, breaking the handrail right off its balusters. It’s the sort of commitment that leaves audiences concerned for the well-being of a performer (in this case, the excellent David Furr, playing bumbling "Nothing On" co-star Garry Lejeune). If we’re already familiar with a property, the stakes have to be that much higher to hold our interest. Wonderful here, Martin conveys that Dotty Otley, leading lady of the show-within-a-show, is essentially a highly paid showgirl talking down to her character. Torturing every vowel (“saw-dines”), Martin puts her stamp on the script with wiggly-fingered antics, wordlessly trying to warn her director (Campbell Scott) that it may be unwise to carry on affairs at the same time with both his “Nothing On” stage manager (Tracee Chimo, of “Bad Jews”) and leading lady (a hilarious Megan Hilty). Scott, the Broadway and film vet, imbues Lloyd Dallas with a director’s stereotypical sense of entitlement, exasperatedly bellowing orders toward his clueless cast from the aisles of the American Airlines Theatre. Of Hilty, as inept ingenue Brooke Ashton, let’s note: You have to be an excellent actress to play a bad actress. Brooke is the least skilled performer in the “Nothing On” cast, so resolutely committed to what she does that, when things go awry, she can’t improvise. Hilty silently mouths the lines of her co-stars, lest she miss her own cues, underlining every emotion with histrionics: wildly waving her hands on the stairs to indicate “fear,” or striking a cheesecake pose to indicate she’s making a bold point. Chimo, as Poppy, the stage manager, is good, though we wish the wickedly sharp actress had more opportunity to strut her stuff. As Belinda, the closest thing to a competent performer in the “Nothing On” cast, Kate Jennings Grant takes a boilerplate part, but turns the character into someone likable. Review: Keira Knightley in "Thérèse Raquin"
Jeremy Shamos (“Clybourne Park”) runs with his role as Frederick Fellowes, the character actor who takes method acting way too far. Rob McClure, the “Chaplin” star, is charming as the put-upon stagehand, who becomes so terrified when forced into understudying a role that every inch of his body trembles. Finally, Daniel Davis (he was Niles, the butler, on TV’s “The Nanny”) is on the money as Selsdon Mowbray, the stock booze-swilling actor who nonetheless hits his mark every time. At the risk of dampening the mood, I don't have warm and fuzzy feelings toward farce in general, and "Noises Off" takes its time building to full-fledged nuttiness. But director Jeremy Herrin ("Wolf Hall") shrewdly pulls off “Off” with one intermission, combining the traditional second and third acts into one. Things here just flow. This is the comedy’s third Broadway appearance; a not-so-joyfully received 1992 movie starred Carol Burnett and an astounding line-up of stars, among them John Ritter and Christopher Reeve. If “Noises Off” happens to already be part of your theatrical DNA, can it still offer the shock of surprise laughter? Here, yes. Even if you know the farce inside-out, this team ensures that some laughs will catch you off guard. “Noises Off,” through March 6 at the American Airlines Theatre, 227 W. 42nd St. Tickets: $67-$137. Call 212-719-1300.